Jen Mirabile: Corduroy comes home! 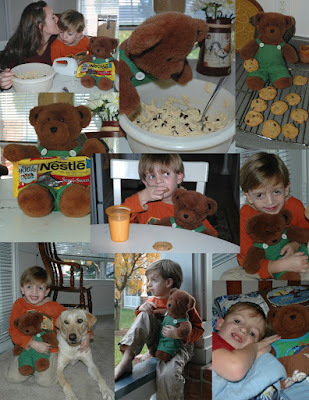 This weekend Andon got to bring Corduroy home from school. When I picked him up Friday he came running out of music class grinning from ear to ear about this! When we went for orientation to meet his teacher on the first day she told us how she let's every kid have a chance to take him home and we have been waiting ever since. Last week when another little boy's name was called Andon came walking out with tears in his eyes! Sweet little guy! I told him " your chance will be soon".. And his name was pulled next. He is so stinkin' cute! What a sweet idea they have with Corduroy. I love it! Abbie would so love that. Andon you are so cute! Love you guys! What a sweet memory! I love how you captured pictures from their time together. Andon is just too cute! Ellie got to take a froggie home from preschool. She loved it as well. What was I thinking not taking pictures? We had to write a story for her class about their adventures together. BTW, I am super jealous of that beautiful fall tree I see out your window.